Purchasing a boat is a huge investment and often a lifelong dream. These days, boats are made out of aluminium and fibreglass so last a lot longer than the traditional wooden boats did, as they don’t rot. With the rapid depreciation of new boats, more and more buyers are shopping the second hand market. Though this is safer than it once was, it’s still important to ask the right questions before going ahead with your purchase, to ensure you’re not buying a lemon! 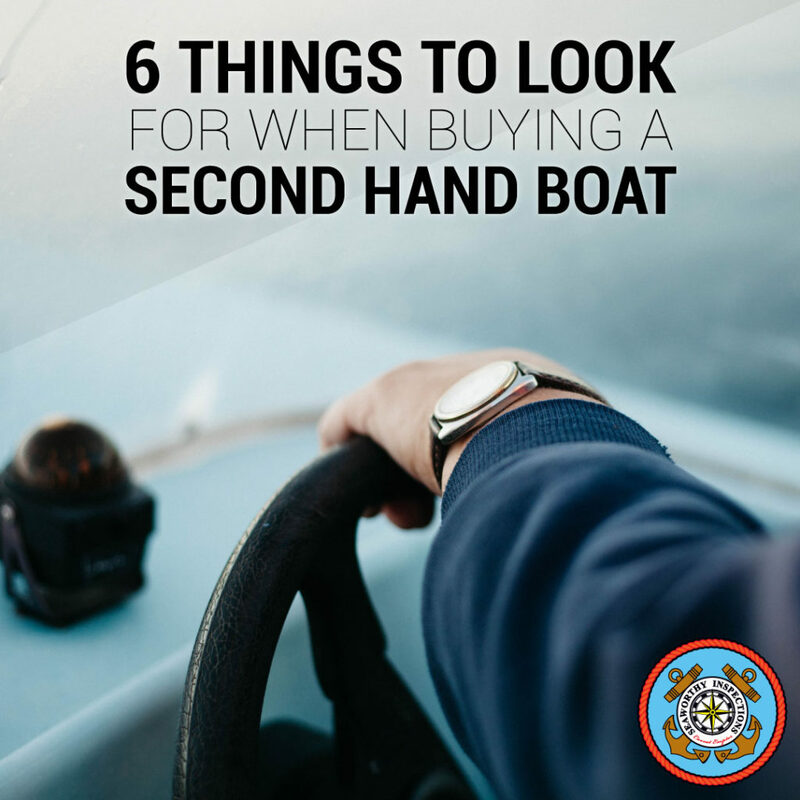 Therefore, here are 6 Things to Look for when Buying a Second Hand Boat. 1- How has the boat been used previously? This question is a great conversation opener. You can gain a lot of information from this question and use it to lead to follow up questions. Asking how the boat has been used can indicate how long it’s spent in salt water, how experienced the previous owners are, and can lead to follow up questions such as maintenance, storage, previous damage etc. The answers can reveal issues with the boat and can help when negotiating a price and buying a second hand boat. 2- Do you have servicing and maintenance records? A service and maintenance record is absolutely crucial when making such an expensive purchase. A good, up to date servicing and maintenance record will indicate any issues that have occurred in the past and will show you how well cared for the boat has been. It’s important that the previous owners have had regular, professional services on their boat throughout its whole lifetime. Ideally, the boat will have been serviced annually by a certified marine technician. 3- How many hours has the boat done? Unlike cars, second hand boats don’t have odometers on them. Knowing how many hours the boat and engine have done will give you good leverage when determining the boat’s value. The average boat should do about 50-100 hours per year. Relying on the hour meter alone isn’t always enough though, as it can be reset much easier than a car’s odometer. Inspect the engine yourself, or even better have a professional marine technician inspect the engine before going ahead with the purchase. Start the engine before purchasing and check it doesn’t start rough, or make excessive noise or vibrations. Check for any signs of oil leakage and corrosion. Do the dipstick oil check for any signs of milkiness, which can indicate water in the oil. If the oil is gritty, this could also be a sign of serious engine wear. 4- Is there any damage? You can’t always rely on the previous owner to be honest with this. If it’s not immediately visible damage they may not bother mentioning it. Visually inspect the boat, or even better, get an inspection from a professional marine technician. Though rot, mould, and mildew aren’t as much of a problem as they once were, they can still occur in older second hand boats, especially around the transom or deck coring. Cracks in the transom are an obvious sign of major structural failure. Keep an eye out for watermarks within the cabin which would indicate leaks. However if the owners have done a thorough job of cleaning it, they may not be visible. If you’re able to, spray the outside of the boat with a hose on full-blast, and check for any signs of moisture below; particularly around hatches, ports and seams. Other major areas that need to be inspected are electrical systems, pumps, stringers, and joints. Thoroughly inspect the boat for all signs of leakage and saturation, corrosion, and rot. If this sounds overwhelming, and you’re unsure about checking any aspect of the boat, always get a professional to inspect the boat before purchasing! 5- What is included in my purchase? Sometimes second hand boats don’t come with on-board gear so this is an expense that you’ll need to factor into your budget. Boats legally require certain safety gear to be carried on-board. If the boat doesn’t come with safety gear, you may be up for thousands of dollars, just to meet the legal requirements. There may be some more luxurious items you’re interested in having on-board as well such as eskies, fishing equipment, upgraded GPS systems and fish finders etc. Add up all the costs of the accessories you want before purchasing. If you’re purchasing a trailer boat, find out if the trailer is included in your purchase or not. If you’re purchasing a marina boat, shop around for a dock to store your boat and find out what the costs associated are. Ensure that the boat you’re purchasing comes with all necessary paperwork and documentation including a signed sales agreement. You will also need to register your boat in your name, and boat trailer if applicable. Registration cost varies depending on where you’re located but it’s important to factor in this cost as well. 6- Should I get a professional inspection before purchasing? This is a question you need to ask yourself as well! Some sellers choose to have their boats tested for seaworthiness and will sell their boat with a SeaWorthy Inspection report to give you peace of mind. If your boat does not come with one, and you have any doubt at all in your ability to check every element of the boat, it is absolutely crucial to have a SeaWorthy Inspection conducted. SeaWorthy Inspections are performed by professional, certified, highly experienced marine technicians. It takes about 90 minutes to complete an inspection and you will receive a detailed checkpoint report on all elements of the boat you wish to purchase. If you’re located within Victoria, Australia, contact SeaWorthy Inspections for a quote today! We can come to the location of the boat you wish to purchase within a week, and will email you your report within 24 hours after the inspection is completed. If the boat is damaged, SeaWorthy Inspections can provide a quote on repairs. Click the banner below to book an inspection.